Do you need some light summer reading? How about a murder mystery where the weapon is … a trivet? This 6.6 x 4.1″ mass market paperback was written by Russell Mead and published in 1982 by Raven House. Copies are still available on Amazon. This book is a fun conversation piece to add to any trivet collection! 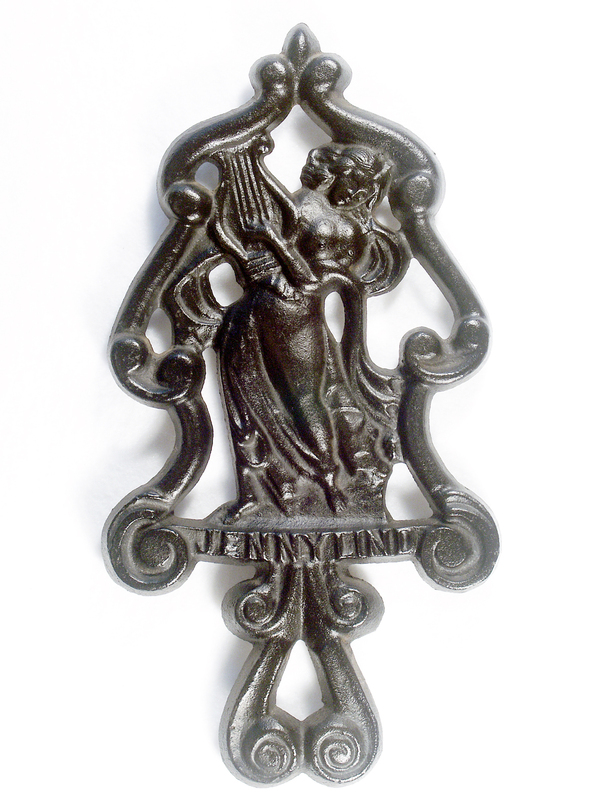 My suspicion is the “murder weapon” photographed for the cover was actually a JZH reproduction Jenny Lind trivet. Cast iron, 8 3/4 x 4 1/2″ w/three feet. On face: JENNY LIND. On reverse: J.Z.H. 1945 E.
This is a John Zimmerman Harner Alphabet Series trivet. John Harner’s interest in preserving rare trivet designs led him to develop and cast a distinctive collection of cast iron trivets, an Alphabet Series featuring a different design for each letter of the alphabet. Finely crafted from original antique castings and produced between 1944 and 1955, these reproduction trivets were a balanced representation of the wide variety of early trivet designs. J.Z.H., date, and alphabet letter are inscribed on the back of each trivet. This entry was posted on July 15, 2017 by Lynn Rosack in Go-Withs and tagged Jenny Lind trivet, JZH Alphabet Trivets, Raven House Mysteries, Russel Mead, The Nightingale Trivet.